We’d love your help. Let us know what’s wrong with this preview of Heart Drops of Dharmakaya by Shardza Tashi Gyaltsen. 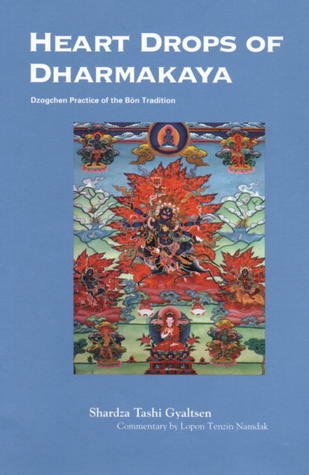 This book presents a complete Dzogchen meditation manual from the ancient religious tradition of Tibet known as Bön. The Kunzang Nying-tig by Shardza Tashi Gyaltsen is a powerful and practical instruction text which cuts to the heart of Dzogchen meditation. Dzogchen is regarded by Bönpos as the highest and most esoteric religious practice. Written in the style of personal i This book presents a complete Dzogchen meditation manual from the ancient religious tradition of Tibet known as Bön. The Kunzang Nying-tig by Shardza Tashi Gyaltsen is a powerful and practical instruction text which cuts to the heart of Dzogchen meditation. Dzogchen is regarded by Bönpos as the highest and most esoteric religious practice. Written in the style of personal instruction from Shardza to his students, the manual is supplemented with a commentary by Lopön Tenzin Namdak, who is himself an acknowledged master of Dzogchen. The translation was carried out by Lopön in the course of teaching the text to Western students at his monastery in the Kathmandu Valley. To ask other readers questions about Heart Drops of Dharmakaya, please sign up. Shardza Tashi Gyaltsen (Tibetan: ཤར་རྫ་བཀྲ་ཤིས་རྒྱལ་མཚན, Wylie: shar rdza bkra shis rgyal mtshan) was a Dzogchen master of the Tibetan Bön tradition who gathered disciples from all traditions of Tibetan Buddhism.